This is not a very good picture of the Kimberling Church, but I thought it an interesting glance into the past. The photo was on an old postcard found in a collection of pictures that once belonged to Ambrose Lafayette Snavely. The 1900 date is my guess as the old post card was not dated. 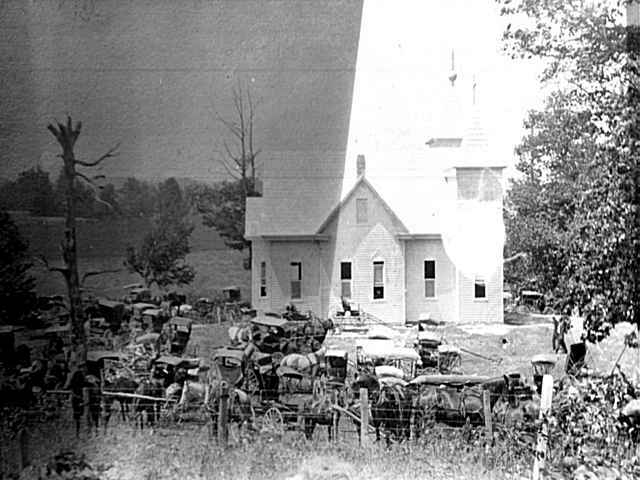 The church is located in the Kimberling Section of Wythe County, Virginia, which is north of the town of Rural Retreat. From Staley's Crossroads (the intersection of US Highway # 11 and state route # 680), drive north on state route # 680, passing underneat Interstate 81 and continuing on # 680 for approximately one half mile to state route # 617 on the left. Turn left on # 617. After approximately one mile on # 617, you will see the church on the left. As with St. Paul cemetery, the identity and date of burial for the first to rest at Kimberling is not known. Also, many of the stones are unreadable, and have been for many years. The number of graves without stones is also not known. Following are the names in stone in Kimberling cemetery that I could identify on May 11, 1981. Two lines of print will be used for those individuals with identifying data, either from the stones, or my knowledge. Line one will contain the individuals name, date of birth, and date of death. Line two, if any, will contain additional data for that particular individual. Son of Josiah & E. J. Son of G. H. & J. E.
Daughter of G. H. & J. E.
Probably wife of Granville H.
Son of H. T. & B. A. Daughter of H. T. & B. A. Daughter of M. & E. A. Son of M. & E. A. Son of M & E. A.
Dau of Charles W. Teacher at Rural Retreat, Va. Probable daughter of W. S.
Wife of Rev. W. R. Brown. Daughter of Michael & Eliz. First Cassell in Black Lick area of Wythe County, Va. Daughter of P. A. & F. E.
Son of E. G. & M.
DUDLEY, CHARLES T.                            1888         189? Son of A. M.& H. W.
Infant son of C. & M. E.
Daughter of A, M. & H. W.
Son of S. H. & E. A. Daughter of Levi & M.
Son of A. & M. E.
Son of Levi & M.
Daughter of A. & M. E.
Son of James H. & Mary A.
HANSHEW, ARIZONA                       Jun 25 1881  Jan 01 19.. Daughter of F. E. & A. C.
Daughter of Levi & E. J. Child of J. W. & M. C.
HUDDLE, JEMIMA                                      Aug 26 18.. Son of John & Mary C.
WW II WVa. PVT. Co. L 112th Inf. Va. SSGT 1001 Helicopter Sqd. Son of D. H. & L. B. Daughter of F. & M.
Son of F. H. & S. E.
Daughter of F. H. & S. E.
Son of T. E. & W. F.
Son of P. T. & M. A. Daughter of G. W. & L. L.
Pro James Jackson, son of Abraham & Mary M.
1st wife of George W.
3rd wife of Peter. Widow of Jacob Tobler Jr.
2nd wife of George W.
Son of G. W. & L. L.
2nd Wife of Capt. John. Daughter of C. C. & M. A. Same stone as P. R. J. Son of Jacob, Jr & Sarah M.
Son of John Jacob & Mary M.
Son of J. A. & N. A.
WILLARD, SAMUEL R.                     Jan 23 1878      10 188. WILLARD, WILLIAM J.                    Nov 13 1867  Feb 29 18.. Wife of W. J. G.
Daughter of J. D. & A. V.